Motorsport's governing body, the FIA, hopes to push through greener engine rules, with a focus on fuel efficiency, before a new engine is introduced in 2013. 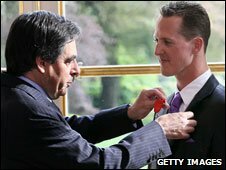 Mercedes driver Michael Schumacher made a trip to Paris on Thursday to be awarded with the Legion d'Honneur, the highest honour given to non-nationals, by French Prime Minister Francois Fillon. The first flying lap of the new Silverstone circuit was drizzling and quite greasy but you still get a feel for the flow of the track and the exciting new sequence of corners, starting with the astonishing new Abbey curve.